"Brother, I ain't trying to be respectful. I'm trying to win." I can't believe the turns this story continues to take, you guys. A bus of jurors rode to O.J. 's house to basically have a garden party and drool over his Heisman? How can it be that the facts of this trial are getting even stranger and more surreal? Must be that Fantastic Voyage we're on. Some of the criticism of this show is that it feels too boilerplate at times. I guess people are pointing to the dialogue when they say this. But, honestly, can you imagine trying to grasp this show if the to-the-point dialogue wasn't there to ground us in the real and expected? I think this feature to the writing serves two purposes though: as viewers, we are more at ease to take in the larger more mind-boggling aspects of this situation that need our full attention and because -- lawyers. If there isn't a collective reliable lexicon, how the hell can a meticulously crafted image, made only out of words, land when it needs to? 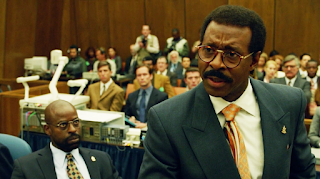 Johnnie Cochran owned this aspect of lawyering in every respect. The fact that the trial has 'slogans' that people remember 20 years later (!!) is proof in and of itself. I remember, verbatim, parts of Johnnie's opening and closing statement. That's insane. ...the turns of phrase -- that's where a case is won. For Cochran, he understood that the composition of words mattered like crazy. Of course he was going to argue against taking any word in the English language off the table! He wants all the words to use at his discretion. I loved the scene where his wife, as his audience, helped him compose his persuasive poetry. But even in his impromptu freestyle in the courtroom about the N-word, his command of the language threatens to outweigh the overwhelming physical evidence to come. Fascinating. Meanwhile, the prosecution perfects taking the high road. But at the greatest cost ever, in reference to the outcome of this thing. Last week, we see Clark decline challenging the jury too aggressively. This week, Darden must take Cochran's public shots at him, in and out of the courtroom, sitting down. It's heartbreaking to watch Sterling's Darden weather the multiple and complex challenges thrust on him and him alone. He had to sort out the overt, the secreted and the unspoken sometimes in the same minute. 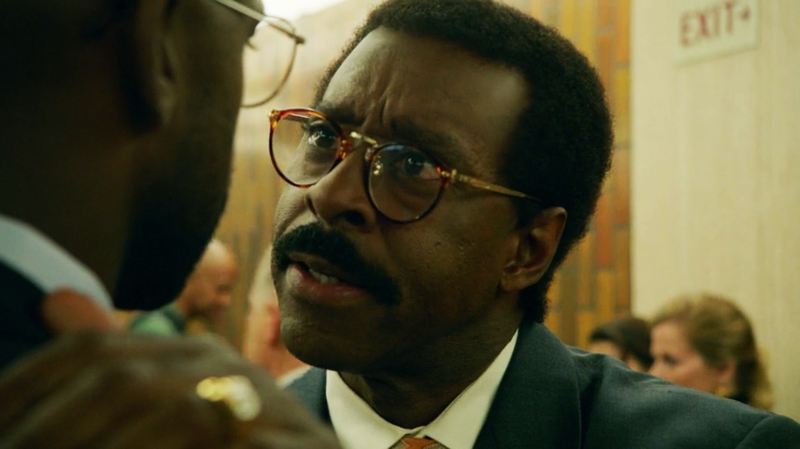 Very smartly, it's his character that symbolizes the devastatingly convoluted effects of the race card -- shown here as the self-conscious knowledge that we live in a world where the awareness of the implications of race is a form of weaponization. The show takes a hard line on the idea that the race card is at its most destructive when it creates an absence of discourse. I think this is where the last shot of Fuhrman shining his Nazi emblazoned medals comes into play. Everyone is in unison here that he's a lunatic. It's so unsubtle, it's almost a cartoon. 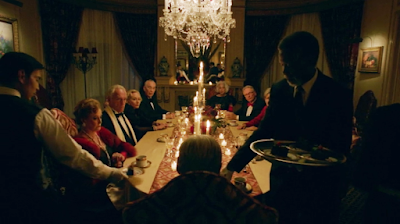 Dominick Dunne's dinner party reading like a scene out of the outlandish and overt Django Unchained, we can all agree is dead wrong. Cochran half-heartedly trying to assure his girls everything is going to be okay is a lot murkier. As are Clark and Darden's few discussions about who was throwing Fuhrman up on the stand. Or O.J. arguing that him establishing himself in this world the way he has shouldn't be judged. Or for that matter, Cochran and his team redecorating the Mayor of Brentwood's house. But nowhere in this episode is the example of the race card's insidious nature better dramatized than in the relationship between Darden and Cochran. I give this series credit for showing that it's the subtle instances, the ones that need to be truly teased out, where our work really lies in understanding our society and ourselves better. without one picture of Paulson?! * "Your Honor, I did not plan to speak on this matter..."
* Come and ride on a fantastic voyage, slide, slide, slippity-slide. I'm dying over the music on this show. * After reading the script each week, I understand how much the actors are injecting into the space between the words. 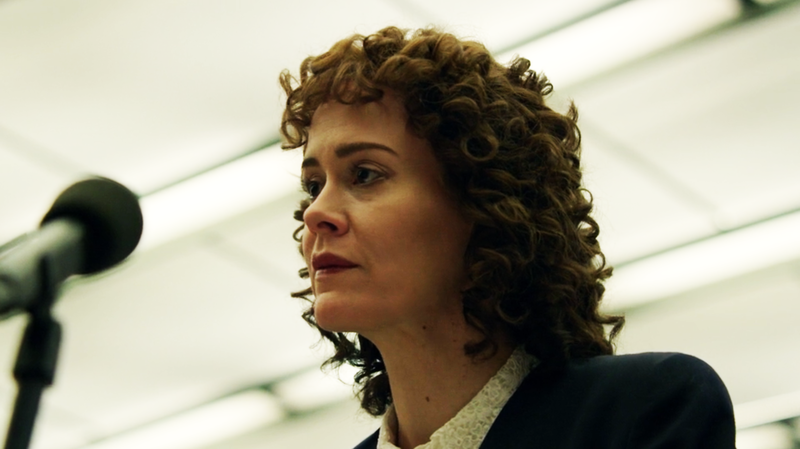 Especially Paulson (yeah, I'm having a lovefest with Sarah Paulson right now. Can you really blame me?) but Sterling and Vance are acting the hell out of this material, too. * You burn in that title card, FX. * I had an acting teacher who used to tell people to put scotch tape on their forehead so they could experience when they were forehead acting. Forehead acting was considered a serious infraction by said teacher because it was a cheap way to communicate what a character was really feeling. Here's an instance where an actor uses it to communicate how bad an 'actor' he is and I can't quite get over how exquisite it is. 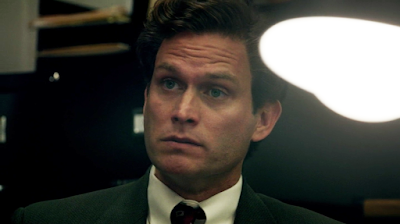 Bravo, Steven Pasquale who's playing the shite out of Fuhrman. Cochran: "Alright, girls, what do we say to the police?" Cochran: "And who talks to the police?" The trial was broadcast on Court TV. I didn't watch the whole thing, it went on too long, but I did get hooked on other trials. The trial of Christopher Longo fascinated me. He killed his whole family in horrible ways and then tried to put the blame on his dead wife. He said she started killing the children, he killed her to stop her and then he had to finish what she started because... He was a sociopath and is Simpson? Who knows, the human mind can be a very dark place. 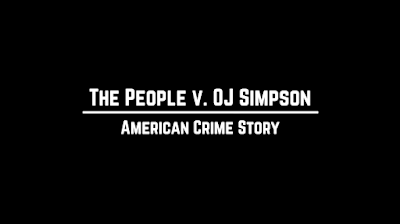 The defense should never have been granted access to Simpson's house before the jury got there. That's ridiculous. Yes, it was outrageously inappropriate, as was scrubbing the humanness out of Nicole's house aka the crime scene. I hear you about Court TV. I could very easily get hooked myself. Dominick Dunne's dinner party reading like a scene out of the outlandish and overt Django Unchained, we can all agree is dead wrong. Yes! And I say that as someone with a big soft spot for Dominick Dunne; I discovered his novels when I was fairly young, and then always enjoyed his totally snobby, Capote-lite writing in Vanity Fair. I think that scene was vital, too, to show how few black people the wealthy white people of west LA come into contact with. Darden, who is probably the historical figure that I knew the least about, is turning into the most interesting character on the show. I'm tempted to read his book. 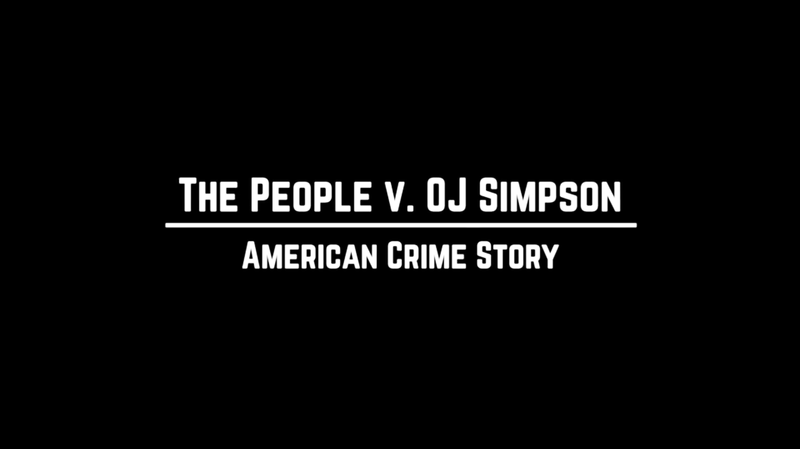 Until this series, I would have said that I knew a lot about the Simpson trial. I would have been wrong. Each episode just drives home how much those of us who followed it avidly were missing. The house visit, for example. It would never have occurred to me that it had been scrubbed. I had also forgotten how Darden came to have such a key role in the trial. Ito is already showing his colors. The look on Dunne's face when the judge shows him the photo of Hall was priceless. Like Josie, I am finding Darden to be the most interesting character. Not sure I want to read his book (he is a bit dry), but his struggles this week were compelling as anything we have seen yet. There are SO MANY books from this trial. Clark has written 4. Darden's is probably worthy. So far, I'm only reading Toobin's which is so well-written. It's subtle focus on sociology and cultural anthropology is seriously riveting. Amazing that this show does a certain kind of nuance very well (music falls into this category,too, imo), along with everything else they do very well. I.E. the Arsenio Hall moment you mention. It was quick, concise and perfect and screamed volumes about both men.